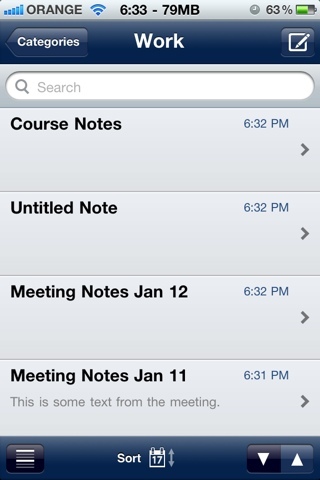 One of biggest missing pieces on the iPhone, is the ability to write notes and easily access them on the web. You can sync your notes with Gmail but you can't edit them on Gmail and they appear in a weird folder as emails. NoteMaster is the perfect solution for exactly that, and more. Notemaster lets you create documents (notes) and syncs them seamlessly with your Google Docs account. That way your notes/docs are accessible to you no matter where you are, and you can easily edit them online using the Google Docs interface. A byproduct of this is that using Notemaster you can get read/write access to all your Google Docs from your iPhone, which can come in REALLY handy. Aside from syncing with Google Docs, Notemaster also gives you access to your Google Docs folders and adds the ability to password protect any folder you want (something that is not available on Google). 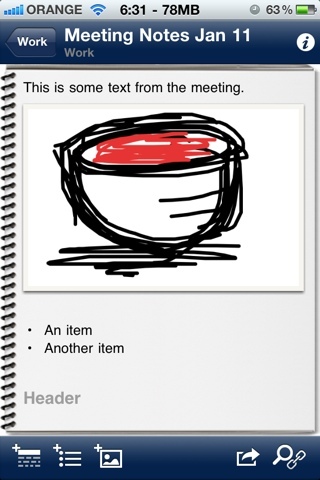 It also lets you create drawings and embed images inside your documents/notes (check out the doodle I created below :). NoteMaster is a bit expensive, $3.99, but for what it does it's totally worth it. There is a free version available, that you can try out to see if you like it before getting the full version. There is also a version for iPad called NoteMaster for iPad that also costs $3.99, which is a pretty good price for an iPad app.